Diego de Almagro founded the city of Trujillo in 1534 as an express assignment ordered by Francisco Pizarro. He founded the city on the Moche River Valley to tatake advantage of the political prestige of its Caciques. Thus, the Chimor Valley has preserved its cultural hegemony, since beginning of our era. Despite the Saint Valentine earthquake in 1619, the fertility of the valley and the determination of its people have contributed to its development. The valley is a rich artistic province and a Republican Viceroyalty. 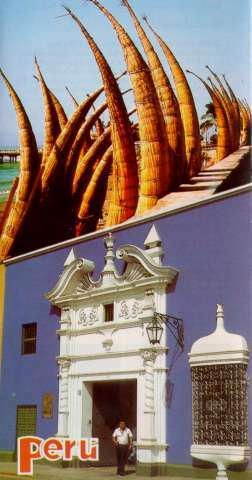 Due to the limitless cordiality of its people and its unceasing intellectual activity, Trujillo has not only become the "Respite of Travelers", but the "Cultural Capital of Peru". It is enough to mention The International Spring Festival. The National Marinera Competition, the Caballos de Paso (typical Peruvian Pace Horse) Competition, the Totora Raft Exhibition, the Contemporary Art Biennial and the International Ballet Festival, among others. Trujillo has a spring climate without marked extremes of hot or cold. During the summer (December-March) the mean temperate is 24 degrees Celsius. The rest of the year is moderately temperate with sunny days. AERIAL.- The Carlos Martinez de Pinillos Airport is located approximately 10.5kms. from the city of Trujillo via highway toward the Huanchaco bathing resort. The Trujillo - Lima flight is approximately 45 min. long. TERRETRIAL.- Via the Panamericana Highway. 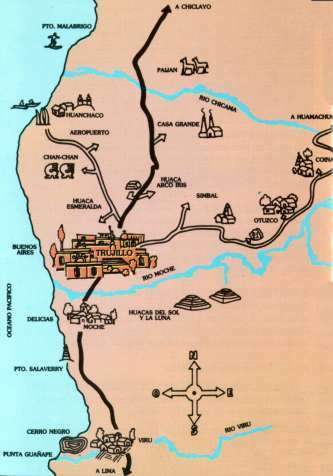 Trujillo is connected to all the cities on the Peruvian coast, as well as all the provinces of the La Libertad Department. Sipán is a Moche archaeological site in northern Peru that is famous for the tomb of El Señor de Sipán (Lord of Sipán), excavated by Walter Alva and his wife Susana Meneses. It is considered to be one of the most important archaeological discoveries in the last 30 years, because the main tomb was found intact and undisturbed by thieves. Tombs were found in Sipán's Huaca Rajada, an area near Chiclayo. Many huaca were found showing Moche jewelry, masks, and art. The tomb of the Lord of Sipan has been dated to around 100 AD. The tombs in the area are of adobe construction, of pyramidal shape, now eroded by successive El Niño events. Excavations continue. A mock-up of the Lord of Sipan's tomb, complete with replica head-dress, breastplates and other grave goods, is open to visitors. 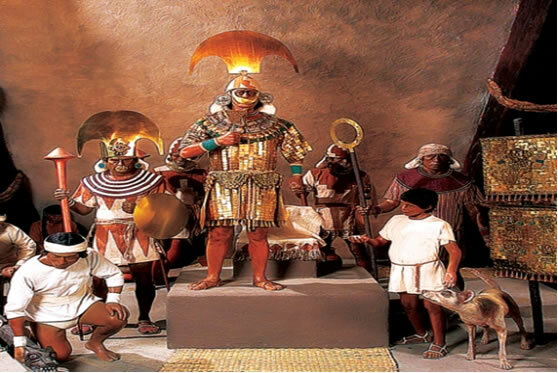 A reconstruction of the Lord of Sipan in his regalia is on view in the Archaeological Museum of Lima, Peru. It is believed that, as with ancient Egyptians, the people placed grave goods, including the remains of servants, to ensure survival of the elite into the afterlife. Also discovered were hundreds of small clay pots with individual faces, understood to be offerings made by the lord's subjects. Several dozens of such Moche tombs likely existed at one time, but almost all known tombs on the coast of Peru have been looted. This looting has occurred since at least the Spanish colonial period. Documented colonial mining laws stipulated how "looting rights" were to be determined. In modern times, the government has declared looting illegal, although it is still widely practiced. The archaeological sites are so numerous that law enforcement numbers are often insufficient to protect them. IN THE CITY: the Catholic tradition has bequeathed beautiful Hispano-American artistic testimonies, objects of constant admiration, to its temples. The main ones are. THE BASILICA (1647-1666).- Rises on one corner of the Main Plaza .Its architecture is sober, but holds valuable choir seats. Baroque and Rococo style retables, as well as sculptures and canvases exhibited in the Cathedral Museum. SAN FRANCISCO (1625).- On the corner of Ganarra-Independencia. Holds a rich collection of retables, the most outstanding being those located on the crosspiece due to their design, carved work, and gold and polychrome relief San Francisco preached from the still - preserved Renaissance pulpit and announced the earthquake of Saint Valentine that destroyed the city (1410211619). THE MERCED (1636).- Two svelte belfries decorate the superposition of architectonic orders that decorate its portal. It is located on the 5th block of Pizarro, and its main altarpiece proceeds from the Church of the Society. Outstanding are the polychrome embossments of the pendentive arch and the only Rococo style organ in the whole city. THE CARMEN (1725). - Considered as the most important architectonic complex in the region. It stands on the comer of Colon and Bolivar. Its interior holds valuable retables, liturgical furnishings and can vases of great value as well as images of high artistic quality The main retable was created by the Master Fernando Collado de la Cruz, a black free man (1759). NATIONAL UNIVERSITY OF TRUJILLO ARCHAEOLOGICAL MUSEUM contains cultural expressions of Peru's diverse Pre-Hispanic epochs such as: ceramics, weavings, metal, etc. In addition, there is. a special section dedicated to the citadel of Chan Chan. CASSINELLI ARCHAEOLOGICAL MUSEUM holds highly valuable pieces from different cultures such as: Recuay, Chavin, Moche, Chimu, etc. all unique in their class. NATIONAL UNIVERSITY OF TRUJILLO ZOOLOGICAL MUSEUM Exhibits samples of the varied fauna of the region. CATHEDRAL MUSEUM Next to the cathedral. Holds valuable sculptures, canvases and an enigmatic crypt. 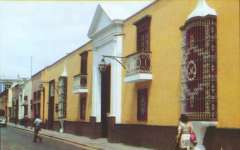 - CARMELITA PICTURE GALLERY Next to the Carmen Church; holds beautiful canvases of excellent quality. - MUSEUM OF THE REPUBLIC Located in the home of the Marshal of Orbegoso and Moncada. GANOZA CHOPITEA.- Independencia N630. The most representative relic in the city. It gathers sequentially artistic richness from the XV11 century to the present, integrating harmoniously each of the centuries-respective elements. Its polychrome portal in Baroque style is crowned with a Rococo pediment and two lions. The ornament is completed with Mohammedan murals, Imperial style windows and a Neo-Colonial balcony, all of which offer a singular charm. MARSHAL OF ORBEGOSO.- Orbegoso Nº 553. The name comes from the ex-President of Peru, General Luis Jose de Orbegoso, the last Count of Olmos. Although it has lost its rear court, the home preserves its viceregal ancestry with an interior garden, stone floors, doors and parlors set on an elevated terraplein. It holds a high quality collection of furniture, silverware, canvases and mirrors. FACALA FAMILY ESTATE.- Pizarro N'314. Its ancient proprietary was Don Pedro de Tinoco, founder of the family estate. Its exterior offers a splendid architecture unusual in its height from which appear to hang ample windows with artistic Republican style lattices. It holds furniture, canvases, images, retables and silverware of the most refined artistic taste. ARANDA HOME.- Bolivar N' 621. Its beautiful, half-breed (mestizo) Baroque portal is flanked by two Salomonic style columns and crowned by a split pediment CORUD. Its main patio preserves the culverts surrounding the wall openings, forming an awning that reminds us, in its similarity, of the Angasmarca temple in the province of Santiago de Chuco. Both of these were properties of the well-to-do Don Martin de Aranda. HOME OF THE EMANCIPATION.- Pizarro N'610. Here was sworn Independence (29-XII-1920). The Royal Ensign of the epochof Don Tiburcio Urquiaga was its proprietary until the XIX century. To this century date back the entrance hall murals, work of an Indian artist who put together the engravings of the Bishop Martinez Compañon. When the home was restored in 1840, the neoclassic style that it presently displays was imprinted. The architectonic quality stands out due to the symmetry of its patios and the harmonious distribution of its atmospheres, lattices, and marble floors. ITURREGUI PALACE.- Pizarro No 688. An exquisite neoclassical two-plan mansion with an ample patio and rear court around which are distributed rooms, a temple, a refectory, etc, all showing the magnificence of their lattices, svelte columns, marble floors and ceilings with golden moldings. BRACAMONTE HOME.- Independiente No 441. Also called the Lizarzaburu home. Its facade displays an ample steel lattice wrought with refined artistic expression. The entrance hall and the extensive patios are signs of the opulence and high lifestyle of the epoch. The panelled ceilings, the svelte columns and Baroque paintings are all worthy of admiration. CALONGE ROME.- Jiron Pizarro No 446. It is one of the few Republican style homes that partially maintain the Baroque division of its patio. It has preserved valuable works of art such as PreHispanic ceramics. Refined furniture, mirrors and paintings, as well as antique banners with the Spanish and Trujillo coats of arms. CHAN CHAN.- The nucleus of the Chimu culture (XII century). It is considered the largest mud city in the world and UNESCO has declared it a Cultural Patrimony of Humanity. In an area of 14 krn2 are scattered palace remains, popular city districts, cultivation fields, cementeries and all that was achieved by this culture extended on the North Peruvian coast. TEMPLES OF THE SUN AND THE MOONS- These were the religious center of the Moche culture in the II-VIII centuries, and they extended from Ancash to Piura. They are constructed out of adobe, forming superimposed platforms that reach a considerable height, which allows them to dominate the valley. They are located left of the Moche River. HUANCHACO BATHING RESORTS.- Located approximately 12 Kms, northwest of the city. Since inmemorable times, this bay was named Guaukocha which means "Beautiful Lagoon of Golden Fish" - In the highest part of the resort sits a beautiful, ancient, Colonial church. The Virgin of Succor, put ashore the 2nd of January, 1537 under King Charles V's commands, is venerated here. Dean Saavedra, a miraculous saint whose body has been maintained intact in an urn since 1707, is also venerated. It is the only ing fishing bay in all of the Peruvian North that maintains still standing thee totora rafts that were inherited by its ancestors. MOCHE VILLAGE.- Located 15 kms. south of the city. Founded 1535 and on December 13th, 1724, its church was built with Santa Lucia de Moche as its patron. Moche was a cultural center since the Stone Age, remains of this period were found in the High Chorobal south of Moche. Subsequently, here one finds the beginning of the Early of Formative Horizon demonstrated by the Cupisniques whose remains can be appreciated in the Complexes of Dead Horse east of Laredo and those of Salinar and Viru that existed until the II century A.D. The presence of the famous burial grounds of the Sun and The Moon in the Archaeological Complex of Moche, -indicates that this area not only continued to be intensely occupied by the natives, but that it was considered as the political and religious center of the Mochica Culture (II to MAD.). SIMBAL VILLAGE.- Welcoming small village the Trujillo mountain area, 3-9 kms. northeast of the city. On our journey, we pass picturesque places such as: Cerro Blanco, Quirihuac. Menocucho and the hot Pedregal, to then arrive at Simbal. The Agrarian Cooperative of Production of Laredo is also in our path. PAIJAN VILLAGE.- Site of famous Caballos de Paso (Pace Horses) riding school, 65 kms. north of the city. MALABRIGO PORT - Better known as Chicama port, 70 kms. north of the city. Highly visited by tourists interested in surfing. Here one finds the longest waves in the world. ARTISANSHIP. Known for the beauty of its: carved work in wood, leather repousse work, mud and clay moldings, printed and engraved gourds. Trujillian wire windows, gold and silver work, engravings of representative customs, totora rafts, straw hats, etc. The Marinera dance, which stands, outs and has given Trujillo the title of "The Marinera Capital", is a lively, festive dance which ends every party. The Huayno, typical of this mountainous region, is a joyful, competitive dance between the man and the woman. Also typical of this region are a diversity of native dances such as: The Negritos, The Huanquilla. The Mojigangas, The Turcos, The Huaris, The Huananayes, etc. A wide variety of traditional medleys including: seco de cabrito a cabrito de leche (baby goat dishes), causa en lapa (vegetable and yellow potato dish), ajiaco (hot potato stew), cuy con maní (guinea pig with peanuts), shambar, theologian soup, duck with rice, Trujillan sangrecita, cebiche, steamed and hot dishes; as well as the delicious king-kong, alfajor machacado de membrillo and the exquisite chicha de jora (fermented maize beverage).